All alumni, friends and guests are invited to attend the 110th St. Pat’s pre-parade party on Saturday, March 17, 2018, at Hasselmann Alumni House, located at 1100 N. Pine St.
Complimentary breakfast items will be served before the parade, along with a cash bar featuring beer, bloody marys and mimosas. Make plans to travel to Rolla for St. Pat’s or attend one of the section events in your area. Help make the 110th celebration the Best Ever. Students Today, Alumni Tomorrow (STAT) hosted a free barbecue and informational meeting during the first meeting of the fall semester. On Wednesday, Aug. 30, attendees ate chili and grilled hot dogs and learned about the student section of the Miner Alumni Association. All students were entered into a drawing for a PlayStation 4. Col. Bryan Sizemore, MS EMgt’00, assumed command of the U.S. Army Corps of Engineers St. Louis District. Sizemore is the 52nd commander of the district, having previously served as a senior officer at the Maneuver Support Center of Excellence at Fort Leonard Wood, Mo. The St. Louis district manages the 300-mile Mississippi River watershed above the Ohio River by applying engineering and scientific resources to preserve, restore and enhance the environment. Rebecca Johnson, CerE’83, MS EMgt’92, PhD EMgt’99, retired deputy to the commanding general and retired senior executive of Fort Leonard Wood, Mo., began a new assignment as executive director of development for the College of Engineering and Computing (CEC) at Missouri S&T on Sept. 11. Emily Hernandez, EE’16, a Ph.D. student in electrical and electronics engineering at Stanford University, discussed her efforts to encourage young people to pursue an education in a field related to science, technology, engineering and math (STEM) in the July 17 issue of The Institute, an online publication of IEEE. Hernandez mentors pre-university students in California who are interested in a STEM field. She has worked in youth outreach since she was a high school student, when she first mentored young girls at a camp for engineering. That initial spark encouraged her to be creative and unafraid of failure — lessons she tries to instill in all her students. 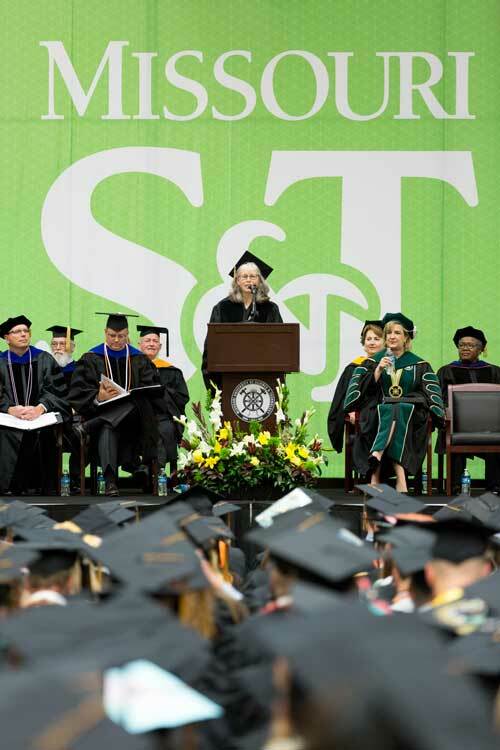 Stephanie O’Sullivan, CE’82, former principal deputy director of National Intelligence at the Office of the Director of National Intelligence, was Missouri S&T’s May 2017 commencement speaker. In her talk, she encouraged S&T graduates to be willing to tackle big challenges and then do the hard work to back it up.